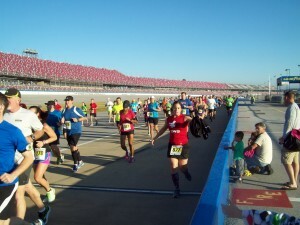 This past Sunday I ran the Talladega 21000 (Half Marathon) for the 2nd time (last year being the 1st). Race morning started with a 5 a.m. alarm and after I had gotten mostly ready, I woke the rest of the family. We all finished getting ready, packed up, and were checked out of the hotel and on our way to the Talladega Super Speedway by 6:15. It was only about a 20 minute drive to the track and we had no problem finding parking. I had my 2 packets of chocolate GenUCAN (mixed with 12 oz of water) and then hit the porta-potties. The line wasn't bad at all – maybe 10 minutes from getting in line to being done. And then it was time to say goodbye to my guys and head to the start line. I took a couple of quick pictures with my phone and then we were off! 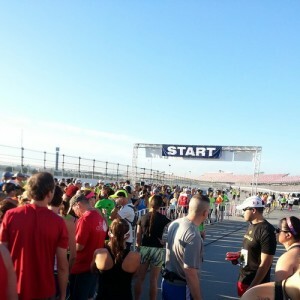 The race started just after turn 4 (it's a NASCAR track, so think like a race car driver) and then we ran down pit lane. My guys were waiting for me near the end of pit lane, and I handed my jacket off to them – I started with my jacket because it was only 55 degrees out and it felt chilly after not having anything below 70 for months. I had zipped my phone into my pocket of my jacket, so I didn't run with it. The race continued around the track and then near turn 3, we headed up on the outside access road around to turn 4 again where we exited and headed out on the roads for a few miles. We were still on track property, just running around the parking areas. 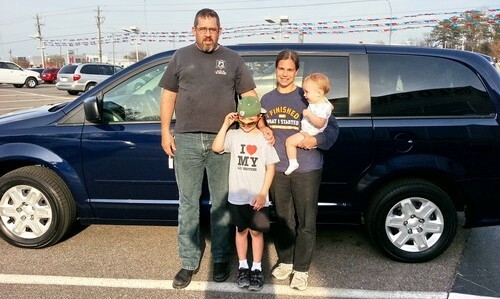 Part of it was on a crushed gravel road and that was a nice change. Around mile 6.5, we had a short steep climb to the grandstands and we ran under the grandstand on the front stretch, continued around the track on the upper access road, and under the back grandstands. My Garmin went a little wonky under the grandstands, but it all averaged out in the end. After the back grandstand, we headed back onto the track via the tunnel that goes under the track!! It's a short steep downhill and then a short steep uphill, but oh so cool to run under the track! Then we ran on the infield access road back to just past the start/finish line for our final lap around the track – this time we went all the way around. And it was during these last couple of miles that my knee decided to remind me that it was hurting. Up until about mile 11.5, I was on pace for a new PR, but then my knee started hurting and I had to slow down and walk a little bit more. I did manage to finish though, and with my 3rd best half marathon time! I finished in 2:17:34, which was 49/78 in my age group, 188/399 for females (yay for top 50%!! ), and 503/813 overall. My mile splits were 10:29 (had to stop and retie my shoe), 10:18, 10:13, 10:18, 9:48, 9:58, 11:10 (end of 6/beginning of 7 was under the grandstand, so may not be accurate), 10:15, 10:15, 10:08, 10:46 (that's when my knee started hurting), 10:58, 12:04, and 9:10 pace for the last .1. 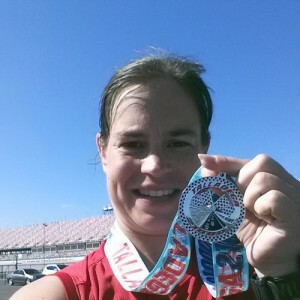 I had no fuel during the race except for water at the water stops – yay for my 2 packs of UCAN before the race!! Other than my knee, I felt really good the whole race, and given my knee, I'm really happy with the results. After getting my medal and some orange slices, I found my guys and we headed to Victory Lane for post-race photos. We got a family picture in Victory Lane and then headed to the garage area for the post race party. 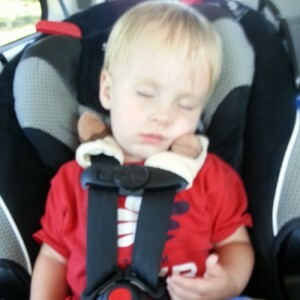 I guess I should mention at some point that it was post race for all of us! 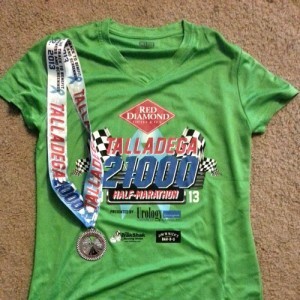 Ryan and the boys did the Talladega 1000 – a 1km fun run/walk. Yay for them!!!! Robert wants to do the 5K next year. 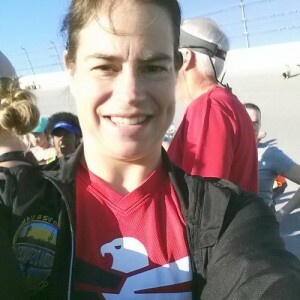 On the way to the post-race party, Ryan stopped to talk with one of the track employees for a little bit, so I took a minute to take a selfie of me with my medal. It was a really fun race and a fun family weekend, and I hope that I'll be able to run this race again next year! It was also a good training run for the Marine Corps Marathon in October, and a good trial for my fueling! I'll leave you with a shot of the race shirt and medal. . .